The simplest and cheapest option to have unlimited emails on your domains. Period. Try Tiliq risk free. No credit card required. You want emails for your domain(s). Compatible with Android, iPhone, and iPad. Including Outlook, Apple Mail, and more. Native desktop applications. Available for Mac, Windows, or Linux. Whether online or offline, our beautifully designed applications will allow you to work faster so you can do more with your time. Mobile applications. Want a secure way to access your business email on the go? Download our apps for iPhone or Android and stay in touch anywhere you go. Shared mailboxes. Great for busy executives, leaders, managers, teams, and even for customer service. You set permissions and everyone you want can access the shared inboxes for increased productivity. HTML5 and CSS3 friendly. Embedded audio, video, and form support. View emails as they were meant to be seen by the sender and access the information you need more quickly. Dropbox and Google Drive integrations. Send large files without having to upload them to third-party websites. Attach files to outgoing emails and save files received faster with these handy integrations. Unlimited email aliases. Create email addresses alises for your emails and have them redirect to any other email of your choice. Welcome to a more connected inbox. Quick actions & highlights. View critical information without even opening the email. Take actions related to the content in emails; great for confirming events, checking into flights and hotels, and other time saving tasks. One-click setup to support applications. Redirecting email to popular customer support applications like Desk, UserVoice, Olark, ZenDesk, Jira, FreshDesk, and many others is now simpler than ever! Top level security. If you're using outdated SSL encryption strategies, your emails could be at risk. We use modern TLS encryption to better encrypt your data and keep it secure. Automatic backups. 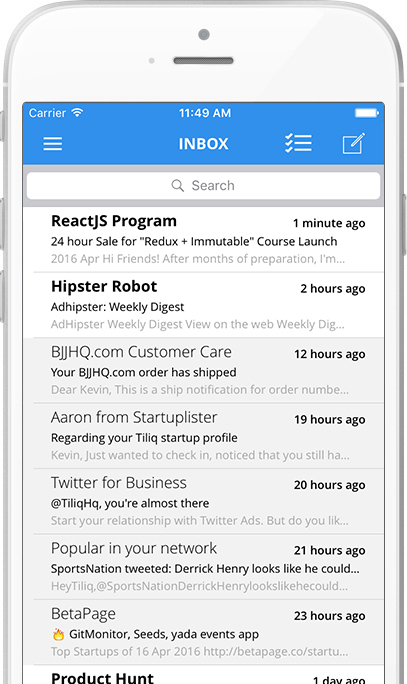 Most self-hosted email services store messages in one location, while popular services typically store in two locations. We save your precious data in three different data centers. We have your back! Back-up, that is. Flexible pricing. Starting at $0.10/GB, you can set the price you want to pay with us. Stop wasting money paying those ridiculous per-user/per-month rates with limited storage. Tiliq has no annual commitments, just pay as you go. Easy to configure and manage. We do all the work and maintenance so you can focus on your business. We know that, traditionally, setting up business email has been time consuming. We just made it simple!